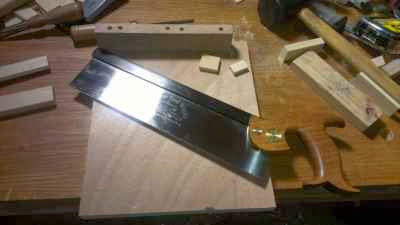 Pragmatic Woodworker: Court Jester Woodworker? Sometimes I wonder why I keep at this woodworking thing. Sure, I have a couple cool tables and a score of scout derby cars for my efforts. But, it seems the more I do it, the more my shortcomings are revealed. 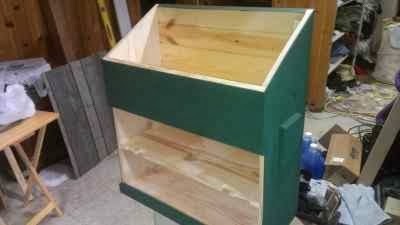 I finished the carcase for the Dutch tool chest a la Popular Woodworking and Chris Schwarz. The top hinges are on back order from VanDykes hardware. They have been on back order for a while now and I'm tired of waiting so now on to working on the innards. I remarked before about how it was tough to keep square during the glue up. I failed again. The case ended up out of square. I used tongue and groove carsiding for the back. I cut each board wide enough to ensure coverage across the back of the out of square carcase. Once in place I glued the tongues and nailed in the boards. I planed the end grain by hand until both long sides were flush. The innards for this box are pretty simple. However, I held off on doing the tool racks until I gave it more thought. I have opted for two rows of rack. The first rack is for flat tools and the second for anything else. I'm pretty sure I will lose floor space in the top compartment by making this decision, but so far I'm OK with that. Tonight I started the top rack (flat tool). The rack is in three layers. The back board is 1/2" thick. The middle layer is 1/4" thick spacer chips 1 1/8" wide. The top layer is a 1/4" thick solid board. I made the chips easy enough on the table saw over the weekend. Unfortunately, I found out tonight that 1 1/8" is too wide for the spacing I want. It is far too cold to go back out to the Outside Shop where the power tools live, so I'm stuck with the inside shop resources to make shorter spacers. 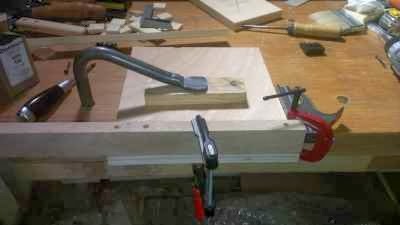 I used to have a nice bench hook made of scraps. It got pretty chewed up, so I threw it away. I told myself I'd make another from the scrap bin soon enough; as you might have guessed already, I never made the new bench hook. So, here I am looking for a way to cut some small spacers in half. 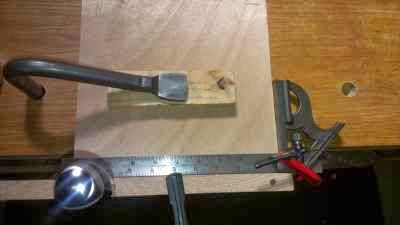 I figure a bench hook is a lot cleaner than a chisel, allowing me to use both sides of the cut spacer. Instead of making the top tool rack in less time than Pink Floyd's Dark Side Of The Moon, I cobbled together a bench hook with what I could find around the house. Making sure the top hook is square pictures one and two.